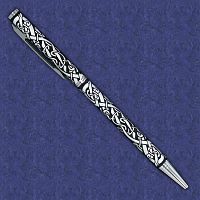 - Inspired by centuries of Irish artwork, these pens are simply perfect for anyone who wants to bring a little magic to a mundane task. 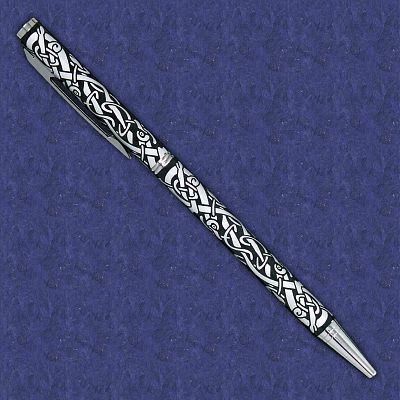 Slim Celtic ball point pen writes in black ink, and measures 6 1/2" long. Comes with a gift box. Uses a standard Cross type refill available at most office supply stores. Do you have any other questions about our Celtic Dragons Pen? I bought this as part of a birthday gift for my best friend. I cannot wait to give it to him! 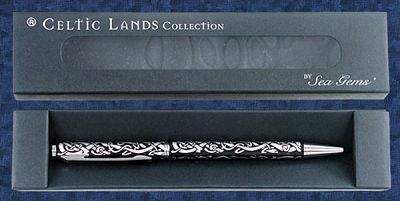 It's a very ornate design; sleek and one of a kind. It exactly as pictured. I like that it comes gift boxed, too.